Sierra de Grazalema has always been on my bucket list. It is Spain’s wettest region even though it is located in the deep South of the country, in Andalusia. It is best known for its scenic beauty and white villages. A nature park steeped in history, culture and natural beauty, all of which I wanted to capture with my camera. Come along as we explore first gorgeous Zahara de la Sierra, then take the scenic route through fragrant pine forests and verdant valleys to the charming mountain village of Grazalema. Zahara de la Sierra is one of the most scenic White villages in Andalusia. You can clearly see the Moorish Castle as you approach the village. Zahara de la Sierra knows how to make an entrance. As we approach the white village by car, we can catch glimpses of the houses and the castle from a distance. The road winds arond the man-made lake, glistening blue under the bright Andalusian sun. The village is dominated by a Moorish castle, of which only the tower remains today. The position is a strategic one: From here, the Moorish rulers could control the road between Ronda and Seville. We know that great views from here will be guaranteed, so we can’t wait to reach the top. Street in Zahara de la Sierra – the only way is up! We park the car in a road underneath the village and take the steps up the mountain. The streets of Zahara are quiet and deserted. Whitewashed houses line the streets, seemingly unchanged for centuries. The kids race up, we caution them to wait. We know that there are more inclines to come, more steps to take. Even though it is a cool morning in spring, we can feel that this walk to the castle will not be an easy one. Pretty Zahara enjoys commanding views to all sides. We don’t stop in the village centre as we want to beat the crowds and get the hike over with before the sun is too high up in the sky. The further we go, the better the views. The verdant Sierra de Grazalema spreads out all around us – pine forests and olive groves, the man-made lake and ceramic tiled houses. The path to the Moorish Tower is very steep and quite slippery. The hike to the Moorish Tower is steep and tricky. As we leave the roads to climb to the Torre del Homenaje, the Tower of Tribute, the terrain becomes even steeper. The surfaces are uneven and slippery, we need to treat carefully. As we slow down we have more time to take in the natural scenery. It is spring in Andalusia, and the wildflowers are in bloom. They add little dots of purple, white and yellow to the green carpets around us. Zahara de la Sierra is one of the many beautiful white villages in the nature park. The reservoir near Zahara de la Sierra. We finally arrive at the Tower de Homenaje, a square building, almost entirely restored. It is free to go inside so we escape the heat and step into the cool, dark interior of the tower. There is no electric light, and we have to use our mobile phone torches to light the way up the stairs. It is a big adventure for the kids, the way their voices echo in the narrow staircases, the sudden appearance of light through one of the windows. On top of the tower, we walk around the roof to take in the spectacular views of the Sierra de Grazalema. This is Andalusia at its finest, seen during the best time of year. The Tower offers great views of the Sierra de Grazalema. Tiny people to the right looking down onto the village and the reservoir in Zahara de la Sierra. We return to the village centre, find a table on the main square in front of the town hall of Zahara de la Sierra. Order food from the kitchen, croquettes and chicken nuggets, some potato salad, and watch the people going about their daily business. We discuss plans. Our next stop would be El Bosque, then we want to see Grazalema. What we don’t know then is that we cannot find a reason to leave the car at El Bosque. When we arrive at the town, it is siesta time, and the deserted streets don’t offer any temptations for us. 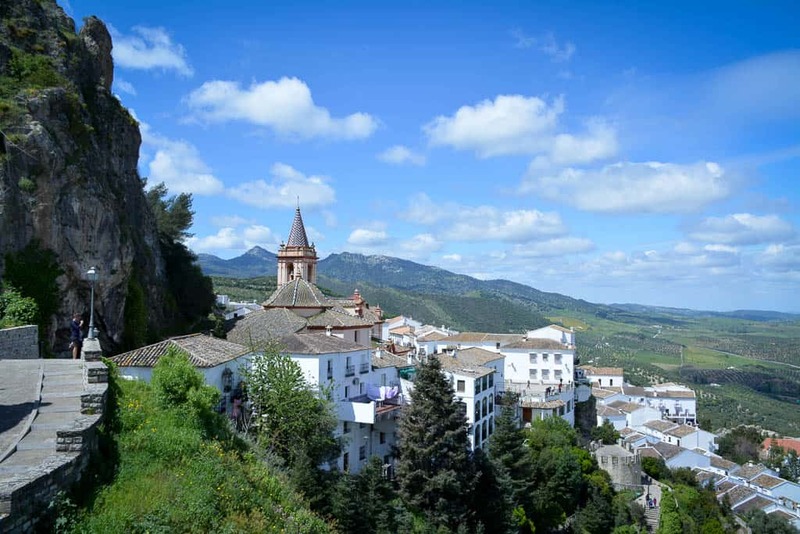 We are not too disappointed though as the route via El Bosque gives us the gift of taking us along one of the most scenic routes in Andalusia, the road that connects El Bosque with Grazalema. Now in spring, thistles and other wildflowers add colour to the verdant landscape. Town Hall in Zahara de la Sierra and main square with restaurant tables. As always, we travel with only a minimum of preparation. We like things to have an impact on us, to wow us with surprises, to enchant us with their unexpected beauty. The route between El Bosque and Grazalema fully succeeds in that. The winding road takes us through dense pine forests, past the picture-perfect white village of Benamahoma. We travel along the sides of a long valley. It is a deeply visual experience, one of the kind that you cannot quite capture with a camera lens. The majesty of the mountains in the background, the zigzagging paths of shepherds and farmers down the slopes, the lush greenness of the valley floors. At Puerto de Boyar, a rest stop and lookout, we stop for photos. The weather is turning, it is only four degrees, clouds cover the sky. We take a few quick shots of the valley with the emblematic fir trees, fail again to adequately portray the stunning beauty of the scene. Then we already arrive in Grazalema. Views of Grazalema Nature Park. Green valleys, fragrant pine trees, and moist air – Grazalema in spring. The mountains and woods of Sierra de Grazalema. Views of Sierra de Grazalema. We arrive in Grazalema and walk into town. The air is crisp and moist, clouds filter the light. It is quiet around us, the only sound we can hear is the ringing of bells from echo from the mountains. At this stage, we don’t know where the noise might come from. We will only spot the sheep as we leave. Grazalema is a very different village to Zahara de la Sierra but equally enchanting. It is not located on a mountain but flows gently down a broad slope. The further we go, the more we dive into the older parts of the village. Founded by the Romans, it were Moorish settlers in particular who gave Grazalema its distinctive appearance. This tall peak is near Grazalema. You can hear the bells of the sheep that are grazing on the slopes. This typical street in Grazalema’s younger part is very wide and perfect for the parked cars of the locals. Grazalema’s streets are, in some parts, wide enough to park your car right in the middle. Grazalema used to be much more prosperous and populated than it is today. The houses still bear witness to this industrial past when Grazalema blankets made from local wool were sold all over Spain. There are a few houses of the upper class lining the streets, their entrances decorated with elaborate stonework. Some houses have tiles peaking from under the whitewashed layer. Typical house of the nobility in Grazalema. A narrow medieval village street in Grazalema. A house with ancient tiles in Grazalema. Near the church of San José we find a small park with an ancient ice well. There are remains of previous buildings to the side of the church, where now the park is. Little trees with pink flowers add colour to the dark green and white hues of the village. Around the church of Iglesia de San José. Iglesia de Nuestra Señora de Aurora in Grazalema. The farther we go, the more narrow the streets become. We see a pretty statue ensemble of two men taming a wild bull. There is a pretty church with a large forecourt, medieval drinking fountains along the sides of houses. We dive into a maze of tiny lanes filled with restaurants, the old Moorish core of the village. At the town hall square we reach the end of Grazalema, enjoy the views of the valley that spreads out underneath. Statue of two men taming a bull in Grazalema. Medieval Drinking Fountain in Grazalema near the church. Views from Grazalema down the into the valley. As we return to the car which is parked near the local cheese factory, we find the source of the ringing bells. There is a flock of sheep on the steep mountain next to the car park, impossibly high up and at constant risk of falling down. It is time to go, we have a long drive ahead of us. Before we head home, we stop one last time for a glimpse of Grazalema. Like a purring white cat it is lying there on a sill, dormant and peaceful. The view is an unforgettable finish to our scenic road trip to Sierra de Grazalema. With kids in tow we couldn’t conquer the nature park by foot. If you are interesting in hiking activities in this area, have a look at this recommended local tourism site. Even without hiking though, we still had a wonderful time driving the winding roads past some of the most scencic nature parks in Andalusia. Sheep in the steep mountains near Grazalama. Grazalema as seen from the road below, lying their peacefully like a sleeping, purring white cat.